one addition to the one of the most popular unleavened flat-breads in Indian cuisine . In one bowl take ginger garlic paste & onion. Now add all spices, lemon juice & coriander & mix it properly with daal. Now make a soft & thick dough of the mixture(do not add all flours if not required add it according to the thickness of dough). Make small portions of the dough & make the paratha with regular method. Fry the paratha with oil. 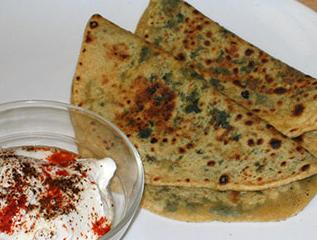 Serve this paratha's with curd .